Maximum D3® is a superior vitamin D3 supplement that was designed by a physician to give patients the quality & effectiveness they deserve. Maximum D3® is a high-quality vitamin D3 supplement that helps support bone health, calcium absorption, and immune system function. It is intended to be taken once a week on a regular basis. 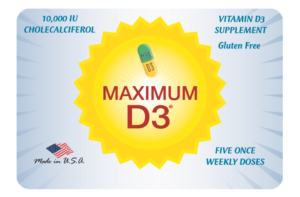 Maximum D3® was the first high-dose vitamin D3 supplement marketed in the United States. It was designed by Dr. Grote when he was an internist in his hometown of Pittsfield, IL. Dr. Grote strongly believes in the benefits of vitamin D (cholecalciferol). He was frustrated that high-quality supplements were not available to his patients; he therefore carefully formulated Maximum D3® to be effective, convenient and safe. Vitamin D is important because it aids in the absorption of calcium and is essential for bone, muscle and immune system health. The two main ways to get vitamin D are through sunlight and taking vitamin D supplements. Maximum D3® is designed to be an acceptable and reliable substitute to sun exposure. Maximum D3® is expected to maintain adequate blood levels of vitamin D when taken weekly by adults. Using Maximum D3® can assist in the prevention of osteoporosis. "Very high quality; doctor recommended this to boost D3 levels"